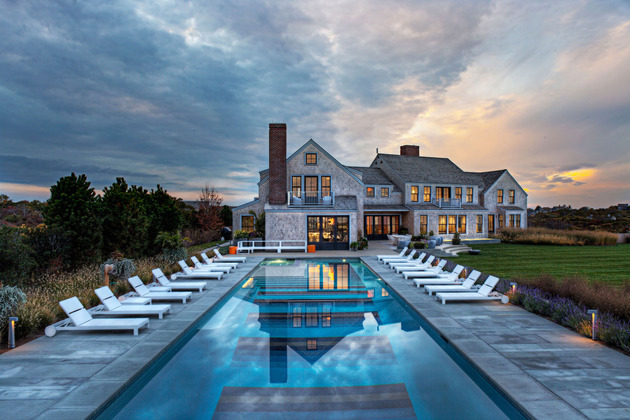 Located in Nantucket, 48km south of Cape Cod, Massachusetts, USA, builders J. Brown Builders designed a home that conformed to the rigid building codes of the area. These codes require that all homes must preserve the historical character of the location by following certain guidelines consisting of pitched roofs and natural shingles facades. 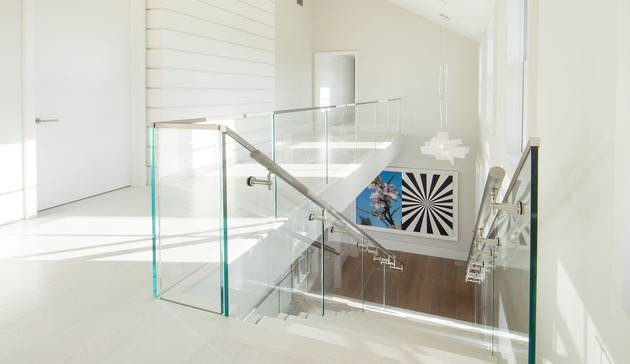 While the Squam residence conforms to the requirements, it breaks from tradition to feature a large and spacious interior filled with bold statements and colorful accents. Included in the interior is a large downstairs party room ready to take over where the pool leaves off, but just off of the pool is the large social zone of dining, living and kitchen areas. The social zone is one wide-open space complete with a dining table ready to sit 16 and featuring a stunning chandelier that is more art then light fixture. The dining area is right next to the pool deck and the wall completely opens up for that ideal outdoor living experience. When the weather is less then perfect and the homeowners prefer to close up the wall, a wall of windows rises up from the floor, complete with a doorway access so pool access is still attainable. 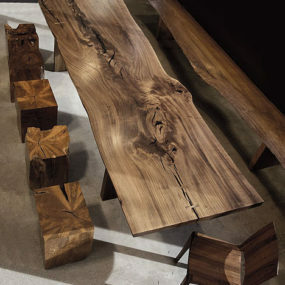 The dining table features 16 Lucite chairs with clear legs and smoked body. Another feature of the area is the ceiling light that consists of multiple colored globes of glass, reminiscent of bubbles floating through the sky. Beside the dining area is the family zone, which is defined by a super comfy shag rug. 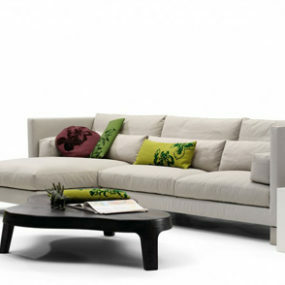 Seating of both pale grey and cobalt blue wrap the area and space age coffee tables nestle between them. Tying in the tables with the seating is the cluster of blue and white poufs while bold pillow choices give a nod to the light fixture over the dining table. In the distance the large and chef friendly kitchen offers additional seating. 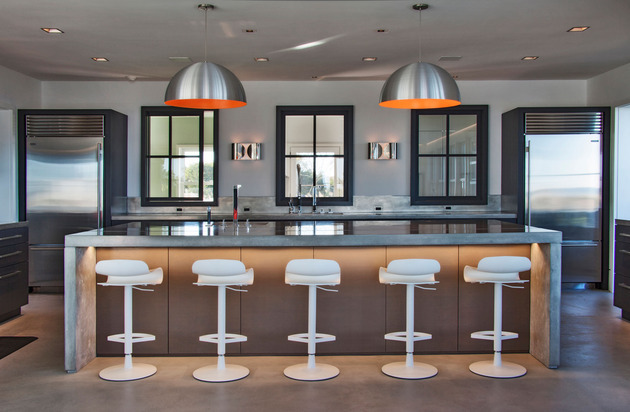 The kitchen is fronted with a large island and bar seating for 5. 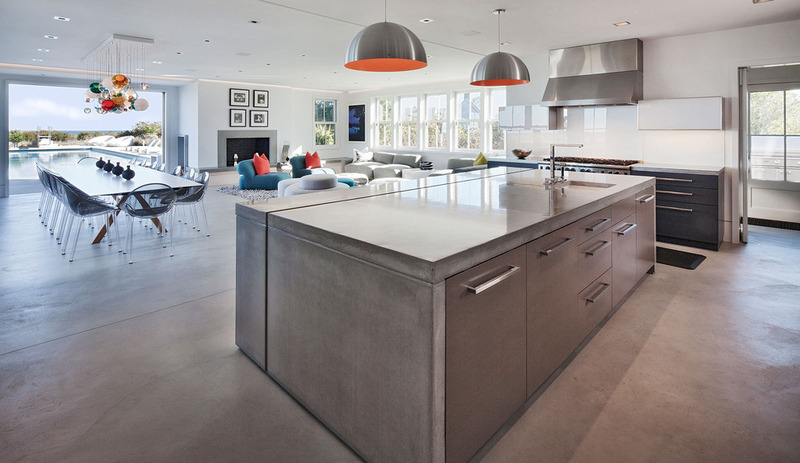 Two large stainless steel pendants over the island create a connectivity to the fridge and freezer on either end of the kitchen wall while their inner core of orange reflect the color choices used on the family room pillows. The 3 windows between the fridge and freezer do no actually offer views to the outside but rather to a room behind the wall. 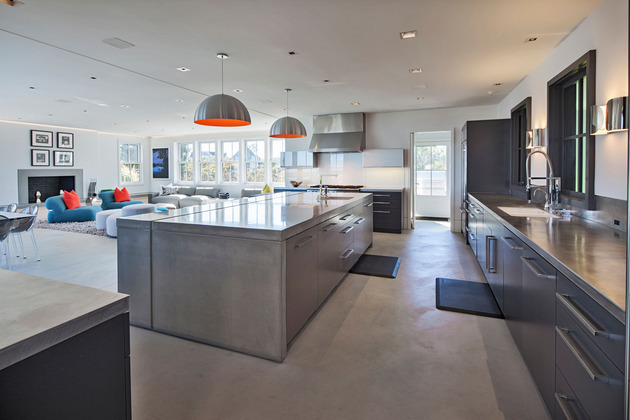 The kitchen within the Squam residence is designed for cooking. Both the island and the stretch of counter against the wall offer enough prep space for several helpers to pitch in. Sinks are located in both the island and below the windows and two side counters are located at either end of the island with the cooktop located on the side counter next to the door. The island is located in such a way as to take advantage of views through windows on three sides of the social zone. While the social zone is the heart of the home, it is not the first place you arrive to from the main entrance. Upon entering the home you are greeted with a foyer that leads up, down, or through to the formal living room. It also looks down through the glass walkway fitted as though it where an area rug next to the stairwells. 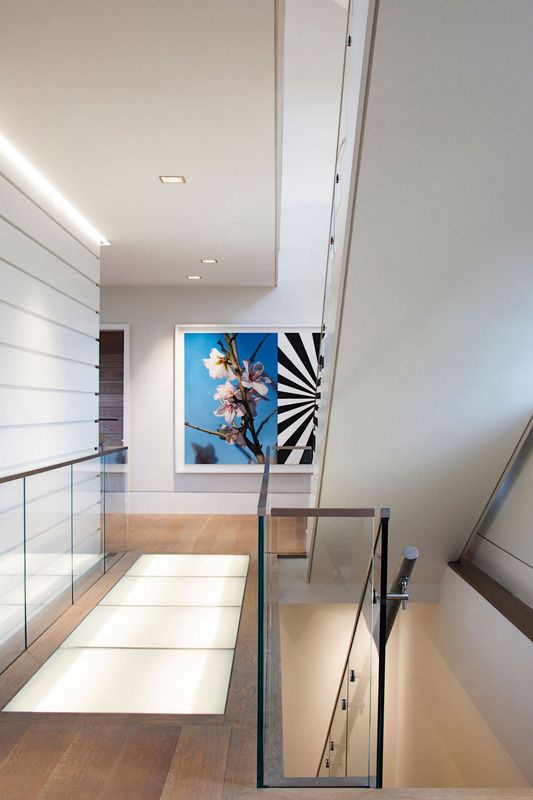 While the entry is wrapped with white walls, colour abounds via the large-scale artworks on the walls just down the hall and over the glass walkway. Just past the foyer is the formal living room featuring white couches against white walls and a bright orange area rug. 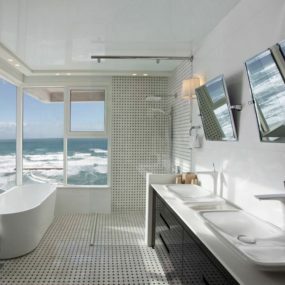 With the splash of color on the floor it does not compete with the blues and greens of the ocean view. 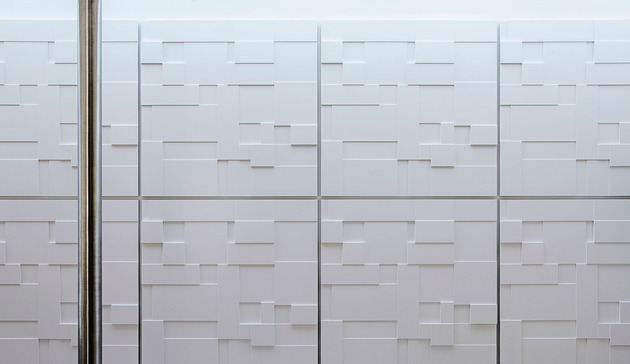 Adding interest to the white scheme is the ceiling channel of light bathing grooves in what appears to be a short wall. The formal Living Room is wrapped with views on one side and a cozy fireplace on the other. 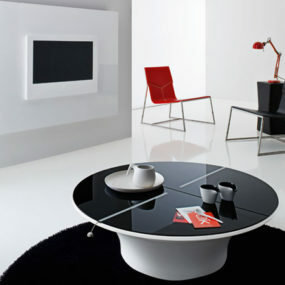 A floating hearth is creates a welcoming spot to sit and warm up on those days the sun doesn’t shine. 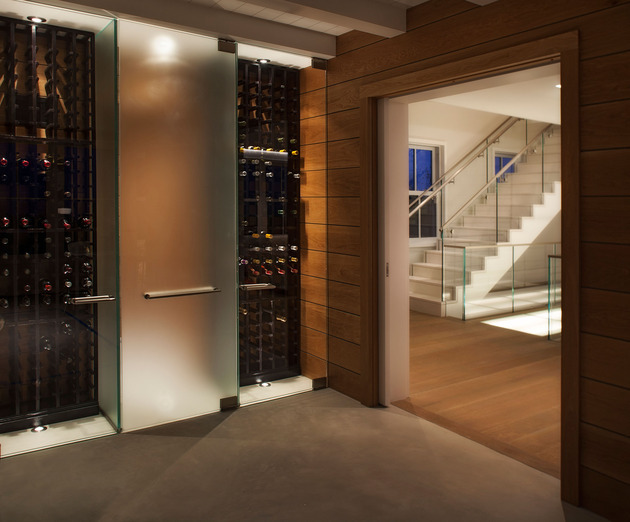 If company drops by and the homeowners would like to share a glass of wine from their collection, the grooved wall next to the foyer hides a shallow closet filled with wine and bar glasses. and the wall of wine and bar glasses is conveniently located just next to the homeowners temperature controlled wine cellar. While you might not want to drink a glass of red wine in the formal living room, you will probably want to take a glass or bottle downstairs to enjoy in the party room. The party room is a polar opposite to the formal space upstairs. Saturated jewel tones cover both the area rugs and the extra deep double sided sofa while 4 Bubble Chairs sway gently fron the ceiling and a series of small bistro tables and chairs line the far wall. 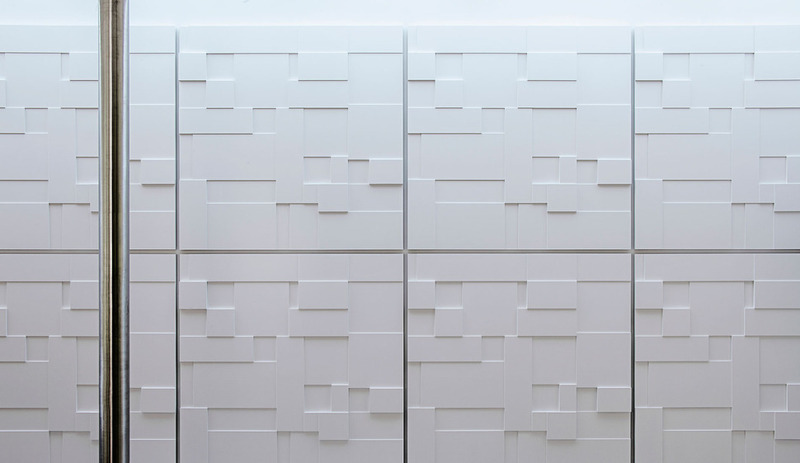 The Bistro table and chairs look out to a textured wall of rectangles. The party room also features a linear gas fireplace set high for easy viewing from all locations and a TV inset into the wall. There is also a pool table in the room next door. 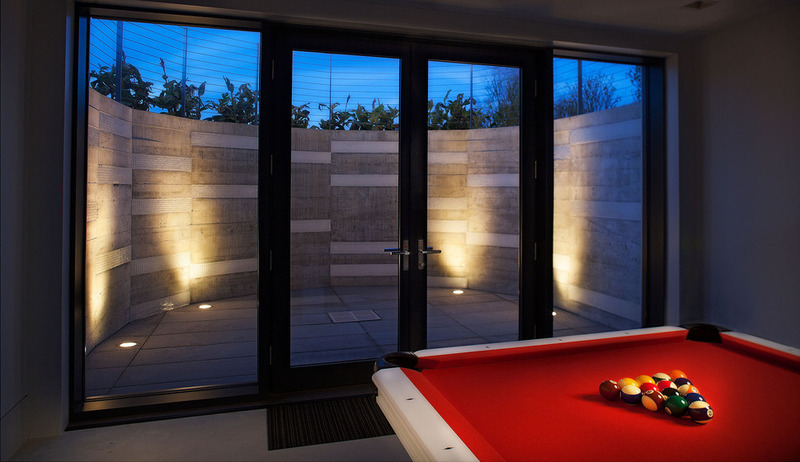 The pool table is felted in a bright red rather then the traditional green and looks out onto its own private terrace. When its time to go back upstairs, the hallway and stairwell are flooded with light traveling through the glass ceiling that is the glass floor upstairs. 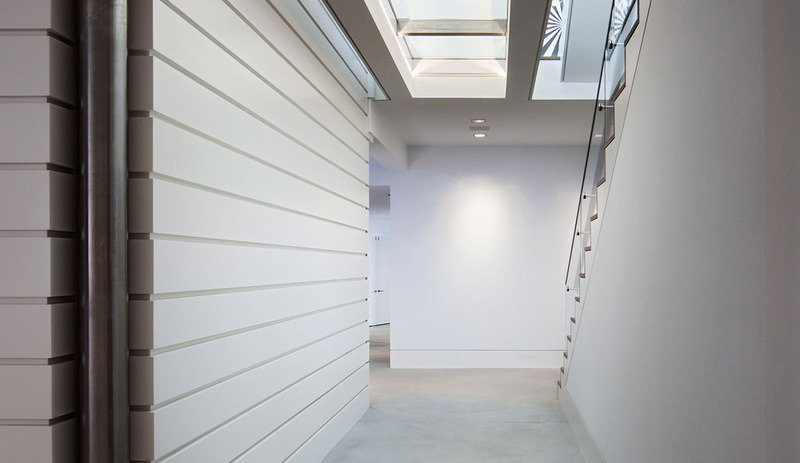 The main floor of the residence features a back entrance complete with a mud room. The mud room is fitted with a storage bench and coat pegs on one side while a closet lines the hall just around the corner. The other side of the mud room has an additional bank of closets and tucked in behind the closets is a quiet retreat bathed in green fabrics. Upstairs, hallways take you to the various bedrooms bathrooms, a rumpus room and a craft room. The craft room contains a table big enough for 6 people. The bright yellow chairs and multi coloured rug are balanced by the emerald green graphic of the world on the wall while the skylight creates a bit of old world charm. 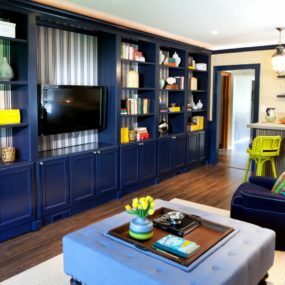 The craft room features a wall of windows on one side and a wall of storage on the other complete with a library ladder for accessing the higher cabinets. 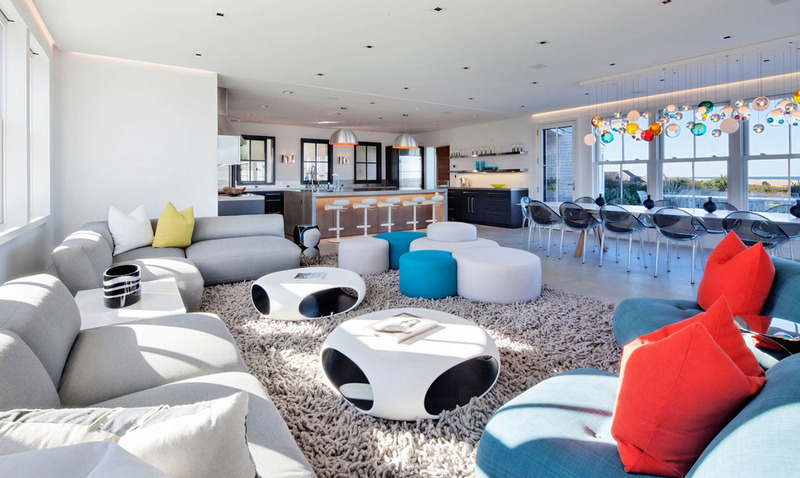 The rumpus room is a large and playful space that is an ideal kid hangout. Bright orange wall sconces look down over emerald green upholstery while a bold pink door closes off the space. The bank of seating in the rumpus room is custom made to fit and the upholstered foam seating is carefully fitted into the curvaceous framework. The guest bedroom is a large space fitted with a laptop station, a comfortable place to sit, a super comfy bed and views of the ocean. 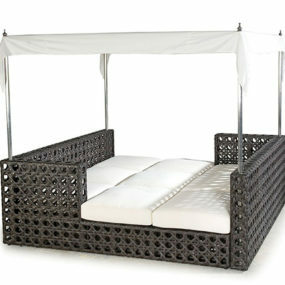 The room comes with its own deck and its own ensuite. 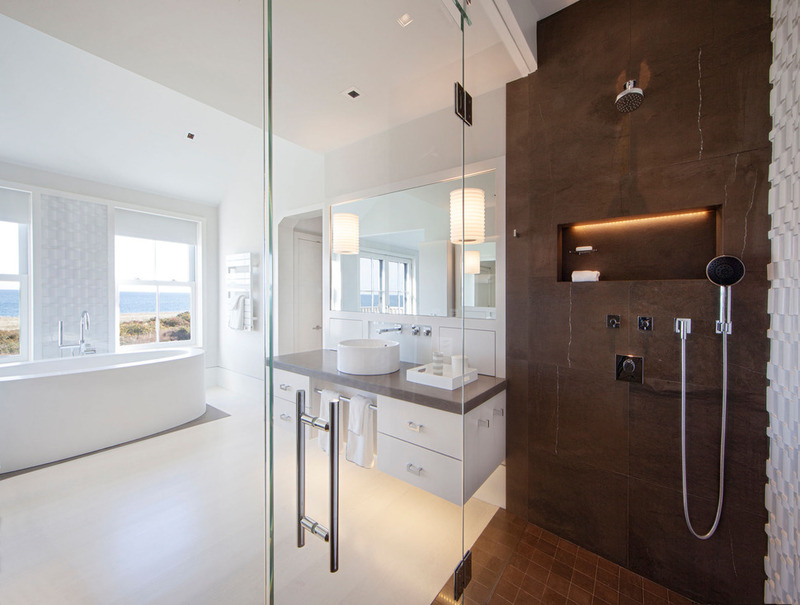 glass tile in a mocha shade are tonally similar to the plank flooring and otherwise the guest bath is a study of white. 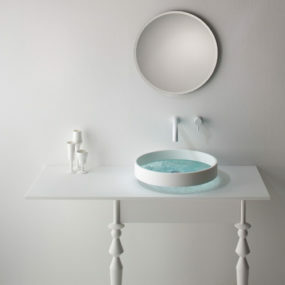 The open vanity holds an oversized vessel sink that repeats the rectangular profile of the tub while the convex pendant and faucets soften the space up with their curves. The Master Bedroom is spacious and cozy with its built in fireplace and soft blue sofa. The blue within the sofa reflects the blues of the ocean through the windows. 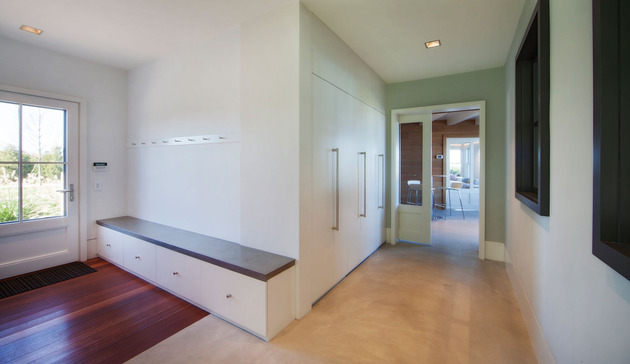 The ensuite to the Master Bedroom is just past the sofa and it can be left open or closed off via sliders that run along the outside of the wall. 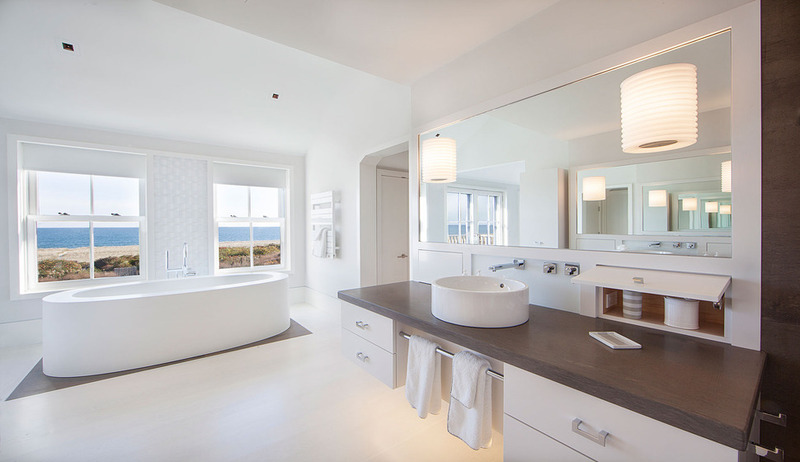 Just inside the ensuite is the free standing soaker tub located beneath the windows for a true spa like atmosphere while bathing. n the other side of the ensuite doorway is one of the two vanities. The other is located across from the first. The vanity features a dark wood counter that is repeated in an area rug fashion around the soaker tub. Hidden storage is located in the wall above the counter and below the mirror on both sides of the sink, both are accessed via small garage doors. The shower to the ensuite is opposite the tub and beside the vanities. It features tiles in the same dark brown hue as the feature woods used. 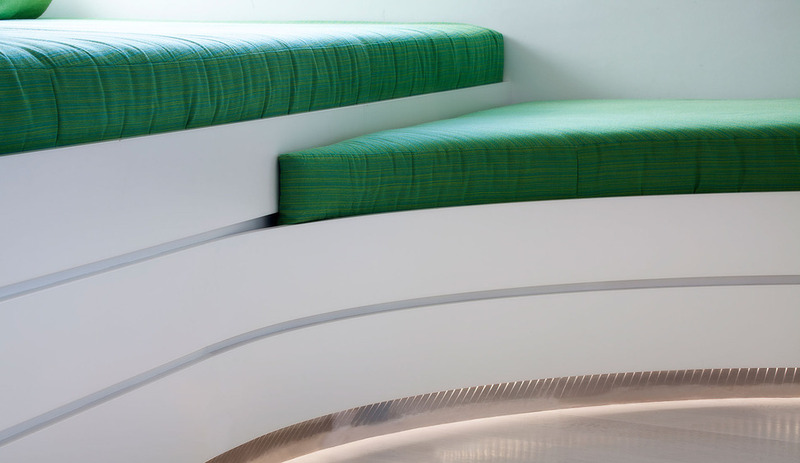 The inset wall shelf is kept light and bright via built in lighting. A third bedroom in the residence is a little girl’s paradise. Pink features abound on both the bedding and in the accessories. 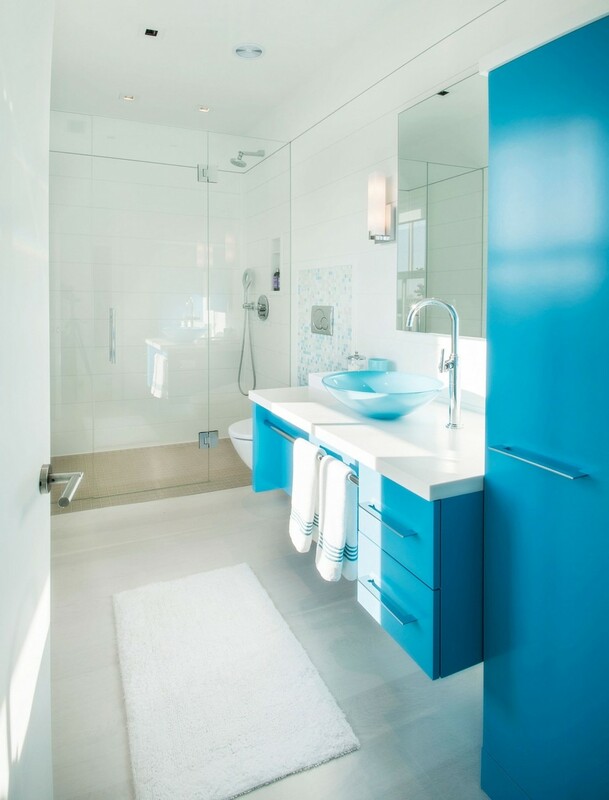 Balancing out the pink bedroom is the blue bathroom. Even the vessel sink casts a blue hue.